There are many reasons for feeling tired, sluggish, and fatigued during the day. But one of the biggest ones often overlooked is nutrition. There are foods that fight fatigue many people aren’t eating enough of each day, causing them to suffer from low energy in the morning, crashes in the afternoon, and trouble staying awake in the evenings. But think about how food is the fuel for your body. If you don’t give it the right energy, you’re going to experience a lack of energy yourself. 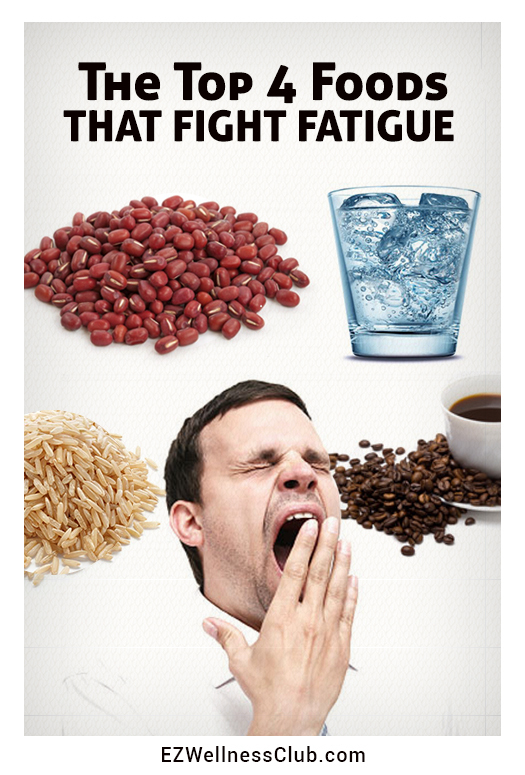 So here are the top four foods you want to incorporate into your day to fight that fatigue. Yep, that’s right. Contrary to advice from popular diets like Atkins and paleo, the truth is that your body needs some carbs to function correctly and get you through your day. You can also get a healthy fix of more simple but healthy, carbs from eating fresh fruits! The combinations of these carb sources will ensure sustained fatigue-fighting energy throughout your day. The problem for many people is that they are eating too much protein from sources that aren’t that healthy—like fried and fatty meats. The protein itself might be okay, but they’re eating proteins that include ingredients like unhealthy frying oils, breading, and butter. These will only contribute to fatigue and tiredness. Basically, water is essential for survival—and essential for energy. So if you’re eating enough carbs and protein but still feeling fatigued and low in energy, you might not be drinking enough water. So drink, drink, drink! Have a glass as soon as you wake up. And carry a reusable water bottle or water jug with you during the day so you can always drink no matter what you’re doing. Not everyone needs caffeine to balance out their fatigue. In fact, some people don’t do well on it. That being said, there’s a reason millions of people reach for their cup of coffee each morning. If you’ve been following our blog, you’ll know soda should be avoided because it contains a lot of sugars (or artificial sweeteners) that are dangerous to your health. But consuming coffee, teas, herbs, and yes, even some chocolate—look for a high cocoa content and low sugar—in moderation can give you a boost of caffeine to fight fatigue. And for a really great healthy boost in performance without any sugar and just 10 calories, try the natural “think drink” FocusUP to energize you for hours! Just remember not to take caffeine too close to bedtime if you have trouble sleeping. Focusing on these four foods that fight fatigue can do amazing things for your energy levels. If you’re still feeling a little sluggish, though, you might want to pay attention to how you’re eating. If you’re over eating, no matter the type of food, that can lead to lower energy, since your body will be trying to process more food than it’s ready for. Practice eating mindfully, chewing your food many times, and paying attention to your hunger levels throughout the day. Another reason for low energy could be not getting enough vitamins and minerals in your diet. Due to modern food practices, even someone eating a healthy diet could be deficient. Take a high-quality fulvic acid supplement like Mimi’s Miracle Minerals to counter balance this.